thanks, that's really phenomenal praise. - my favorite games of all time are as open world as possible (skyrim) but I love love love the style of the old school pokemon games and the childish coloration and sensibility so I'm doing my best to combine the best of both worlds into a game that I could play forever if I wanted to. -I did try my hand at an earlier version and found the maps to be too crowded and the plot too generic, which is why I went so expansive on this version. I found that too many encounters in too small a span made you lose the sense of attachment to the pokemon you catch, and filling a pokedex so easily becomes mundane. I want the room to build in a world where everything fits comfortably, and I frankly don't care about how long it takes to make that happen. I do this for fun in my off time- have currently logged over 700 hrs on RPG maker (that my steam account has counted- does not include the hours I had in the 30 day free trial before I purchased the program) and sitting around game making is one of my favorite activities. It will not be rushed, and it'll probably take another year or two before its even playable. Most likely, as soon as its done, I'll start work on another one. or Pokemon the Reborn of Good (idk, you said u liked something with reborn in it and your overthrowing the evil ruler). I really need a name for my game and keep coming up blank. It's open world (see maps posted in the few posts above) and a very large game. Really intrigued by what I've been seeing you post about this game. I'm looking forward to playing it. Some possible names: insurrection, revolt, rising, subversion. Or, if you are trying in some ways to emulate Skyrim, you could just use the name of the region like the Elder Scrolls series likes to do. Hello. I am new to the site but I wanted to try something. We know of the pokemon games as they are. With the original 150 pokemon, team rocket and Red v Blue with the gym leaders. However, this game features the. You the trainer had fallen and when you wake up you're at the beginning of your journey again, this time its the same Kanto region but different. Everything has been shuffled. The Professor is not Professor Oak but another Professor. Your rival isn't Blue but an entirely different rival/character from another game. The starters are not Charmander, Bulbasaur, or Squirtle but other fire/grass/water types from other generations. Everything has been shuffled. Relive the journey of a familiar yet different experience in Kanto. 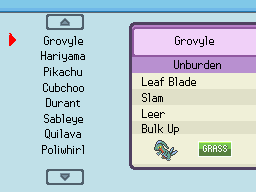 So far I call it Pokemon Blue Au but it is subject to change. So, I think you should be aware right from the start that this is a pretty common concept for fan games, especially in the realm of Rom Hacks where you're starting or with a complete region full of NPCs and battles already programmed. It's easier to make slight changes. This doesn't mean you shouldn't pursue your idea - just know that it's got plenty of company. I've played through Kanto a dozen times or more - both in official games and fan games, and now there's Let's Go, which is just another official Kanto remix. So if you want players to come back to Kanto for YOUR game too, you need to make sure the changes you make are significant and meaningful. You have to tell a whole new story that's compelling. Dig into that part of your concept. Figure out what makes the game YOURS, and make sure that part it's the best that it can be. Hey everyone, with the wiki gone, how can I edit Pokemon moves properly in Essentials? I'm unsure which number does what, and I still need help altering some Pokemon moves for a fangame. Sort of. I'm pretty sure not all the pages are there and that it's not all 100% up-to-date, and it hasn't gained as much SEO traction as the old one yet so it's harder to find on Google (which is probably a good thing if Nintendo is still interested in getting rid of it). But it's still good if you want to find out how to define moves or items or something. I see, but it's great to see the Essentials wiki sort of revived. Makes me feel better about making my fangame now. I'm currently developing a game featuring a special starter: a Ditto. This Ditto, unlike other Ditto, can use Transform in a new way: Instead of copying a foe Pokémon, you can select from all species Ditto has "recorded"! Please read this document and leave all kind of feedback. I really like this idea. I think you're onto the right lines with how to unlock transformations, and how to make them all unique. I'd definitely find it more fun to "randomly" unlock them. Do the movesets change as Ditto levels up? I think it would be nice if the transformations used exactly the moveset of the Pokémon it copied, because it means my brain will be on the lookout for "this Pokémon seems to be better than usual, do I get to copy it?" I'd find it somewhat frustrating to have to use Transform and essentially skip a turn every battle, how do you feel about having it trigger on switch-in like Impostor? Would it make sense to have a way to un-transform Ditto without having to switch out? I'd be totally down for Ditto being my only Pokémon, but that would require a bunch of balancing. If you did go down this route, I'd probably make some rare wild Pokémon that can be copied too. I'd definitely find it more fun to "randomly" unlock them. :thinking_emoji: I wasn't expecting that! For random unlocks, my only idea is to have Ditto unlock a bunch (1-3) each level, probably tiering/weighing them so you wouldn't unlock Tyranitar at Level 9. Both methods aren't exclusive though; there could be "special", fixed unlocks from several trainers, and then a bunch of fillers unlocked as a level up bonus, or else. My original idea is to have each unlock be it's "ultimate" form, meaning the four moves it knows and the ability associated with it are permanent. This may mean early game you would get very simple transformations (Oddish, Horsea... with low BP moves like Water Gun and such, so they serve as coverage but not a lot of raw power), but later you'd find yourself swimming in stronger Pokémon with better moves. That's cool; In my head I wasn't thinking about making the unlocked transformation an exact copy of the Pokémon you beat to obtain it because I wanted them to be have very specific kits, but now I'm thinking about tough trainers (like those Boss trainers in SM and LGPE) with a specific strategy, which could showcase the situations in which the reward transformation could excel (think a trainer with a Drought Vulpix and a Chlorophyll Weepinbell, rewarding the Weepinbell transformation afterwards). Will definitely give those trainers a special look, like the red clothes in LGPE. Interesting, that makes a lot of sense and finally lets me give the Ditto an ability that's not it's default Limber as I somehow disregarded Impostor as it's Hidden Ability. Will for sure implement this! Yeah, I was planning on some sort of consumable (expensive?) item that lets you use Transform again when you use it, but I also thought about having a "Z-Move"-ish command that, while wasting a move (so there's some drawbacks to it? I guess?) will let you Transform freely that same turn, probably with Priority. 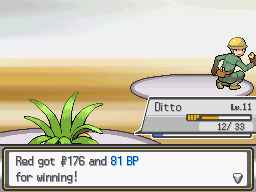 Wasn't considering Ditto as your only Pokémon because that'd be hellish to make long battles interesting. Yeah, I like this. So the simple transformations fall out of favor as the game progresses, but I think that's fine. Something Z-move-ish was exactly what I picturing, yeah. Maybe it untransforms at the start of the turn, and lets you pick a transformation at the end? I think if you transform up-front then it might be a bit too easy to resist all your opponent's attacks? Something superficially like Focus Punch. Ooooooh, this is a neat idea, but I'd imagine balancing it and keeping it from getting stale would be miserable. My main question is, once the player hits mid/late-game and gains access to something almost universally good like a Chandelure or Arcanine or something else, what (aside from Power Points) keeps them from just using that to power through the entire rest of the game? I suppose you could just use a super-diverse set of opponents to make that impractical? Also, a number of decently good in-game Pokémon has trash-tier level-up learnsets and only become usable after you teach them a bunch of TM/HMs/tutors. Are you planning on just rolling with this and having everything's in-game viability be determined purely by its level-up moves, or are teachable moves going to play a role somehow? That's why I'm considering to only go up to "almost good shitmons", like Roselia, but not Roserade, and Maractus but not Meganium, meaning power will come from the strategy and movesets, and not from getting an incredible Pokémon as a transformation. This should make the game tougher late when new transformations are not necessarily "upgrades" to anything, just another option to use. It'll be hard to make them all different enough. As for the movesets, if I have to really change them, I will, but there's also move tutors in the game, using Battle Points you obtain as part of battle prizes, so Pokémon you catch (but not transformations) can have some more variety. Interesting idea, but wouldn't it take too long to scroll through the list of pokémons? Or do you plan on limiting to something like 6? First option will probably be the opponents, so you can still Transform into these, then the other transformations. Not sure what details to give/not give and how to make it pretty, but this is my current mock-up of that screen. If you have any ideas send 'em my way, please! It could be more viable if the player could choose a pokémon type first and then the pokémon they want to transform into.